Faith Ringgold, American, born 1930.
" 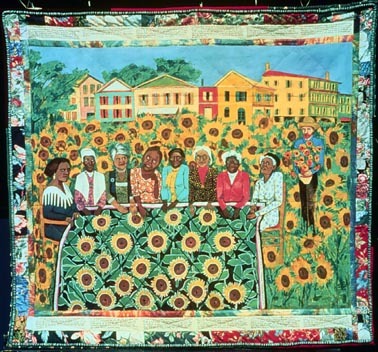 In this fiber piece, eight powerful African American women from the past and present display a colorful quilt that is a communal symbol of their achievements. From upper left they are Madam Walker, Sojourner Truth, Ida Wells, Fannie Lou Hammer, Harriet Tubman, Rosa Parks, Mary McLeod Bethune, and Ella Baker. Vincent van Gogh, well known for his paintings of sunflowers, stands to the right. Through words and text, symbol and metaphor, Ringgold acknowledges the contributions of African American women and honors their traditions. She is a painter, soft sculptor, quilter, performance artist, and author; and she always speaks in a clear voice that affirms women, especially African American women."